Why a whole article on watering tomato plants? Because tomatoes are fussy about water, and watering tomatoes improperly can cause a host of problems, including early blight, blossom end rot, tomato leaf roll, or tomatoes that crack open. Tomatoes should be watered early in the morning while it's still cool, or if you're just not a morning person, in the early evening. If you're watering by hand, use a high volume, low pressure wand and water the soil, not the plant. If possible, set up an automatic drip system or soaker hose at the soil level to avoid getting the leaves wet. I've always heard that if you water plants in the hot sun, the water droplets on the leaves can act like mini magnifying glasses and can burn spots on the leaves, but I have tried this and have never actually seen it happen. But watering leaves in the heat of the day can cause serious fungus problems, such as gray leaf spot (Stemphylium), early blight (Alternaria), and powdery mildew. The photo (above right) is of early blight, a fungal disease caused by too much water. The most important thing in watering tomato plants is consistency. If the soil is allowed to get dry during a hot spell, the tomato plant will not be able to provide its ripening fruit with all the water it needs and the tomato itself will start to die, starting at the blossom end of the tomato. This is called blossom end rot, and once it starts, that tomato will rot and be useless. Blossom end rot is not curable, only preventable. Make sure your tomatoes receive consistent water, especially in really hot weather. 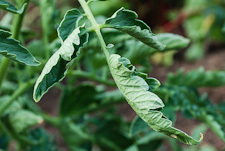 Tomato leaf roll can also be caused by inconsistent watering, especially during hot spells. And too much water can also cause problems. If plants stay too wet, they will have a hard time absorbing the calcium they need from the soil and will end up with tomato leaf roll. The leaves will start to curl over upside down, and may get kind of leathery. This is not a bad problem and will not adversely affect yield, but once it happens, the leaves will not straighten out again. 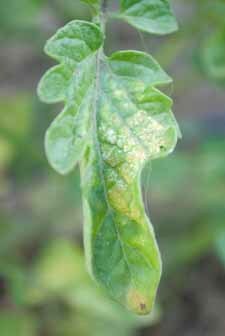 Prevent tomato leaf roll by consistently watering your plants, but not overwatering them (though obviously if you get a string of wet weather, there's not much you can do about it.) Leaf curl can also be caused by not enough calcium in the soil to begin with, which can be addressed in future years by making sure you have plenty of crushed eggshells in the compost you apply annually. You can also add lime to increase calcium, but this will affect soil pH so I would only recommend doing this if you are also running soil tests with your local extension service. When tomatoes crack open while still on the vine, it is generally because of too much fluctuation in water levels - too dry followed by too wet. The best way to prevent it is to keep an eye on the soil moisture levels every day. It's hard to just say "water daily", because temperature and rainfall affect soil moisture, so gardeners have to adapt and be in tune with the garden conditions. If you are growing tomatoes in pots on the patio, it's a great idea to use self-watering containers. If you don't, chances are you'll be watering tomato plants every day, if not twice a day, as ordinary containers dry out very fast relative to in-the-ground gardens. The (clickable) photo on the left is a product called a "tomato halo". They help your tomatoes receive a very even, consistent water supply, and they do two other things as well. It has been scientifically proven that having a red color under tomato plants aids in the development of lycopenes (the red color) in the tomato, which speeds ripening. Also, the added soil height provided at the center of the halo allows the plant to develop roots up the stem, so they can take up even more water and nutrients and grow faster. You can also grow tomatoes upside down in upside down tomato planters. Different manufacturers of these have different strategies for watering. The Topsy Turvy Tomato Planter™ has waterproof sides to retain moisture, but is not self-watering. The Revolution Planter™ from Gardener's Supply, is the kind that I have. It has a reservoir of water at the top that wicks water down into the soil as needed. If you want to grow tomatoes this way see the article on how to plant and maintain upside down tomatoes. The Revolution Planter has a chamber at the top that waters tomatoes consistently and evenly. I have mine on the patio, and love it! Comes with everything you need, except seeds! Waters and fertilizes evenly.